Technology advances every year, and we are always looking for ways to keep your family safe helping to prevent claims. 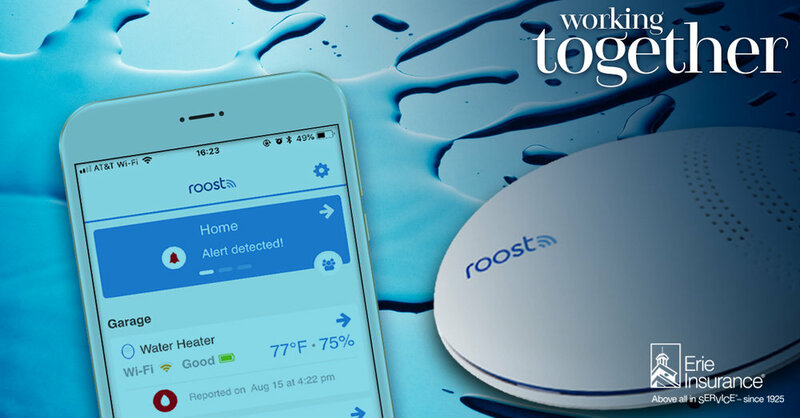 We are excited to announce that Erie Insurance and Roost are working together to pilot a FREE Roost Smart Water Leak and Freeze Detector for your home. Why? By working together, we have a new way to detect water damage and frozen pipes in your home. The sensor fits in the palm of your hand and can have a really big impact when it comes to preventing water damage or even a claim. All you need to get started is the Roost app (which you can download on your iOS or Android smart phone), Wi-Fi and your Roost sensor. The installation instructions will be included in the box and set-up takes only a few minutes to complete. Once you’ve set up your sensor, you can place it in an area where water damage or freezing pipes are a concern. For instance, near a hot water tank or underneath a sink. With minimal effort, this small device could help prevent a major water loss in your home. Imagine being out of town and having a pipe burst and not finding out until you returned home-there could be thousands of dollars’ worth of damages. To avoid a situation like this from happening to you, call us and let us help you get signed up for your FREE Roost Water and Freeze Detector. Supplies are limited and will be awarded on a first-come, first-served basis, so please respond quickly. If you would like to learn more about Roost, visit https://www.getroost.com/. Contact our agency today to find out how to get yours. Forbes recently published an article reporting that only 10% of Millenials have enough life insurance in place to cover self-reported needs should they die. That is a scary statistic. Not carrying the proper life insurance puts your family members at financial risk, in the event of your death. Millenials report a 78% shortfall in life insurance coverage. By contrast, Gen Xers report a 48% coverage shortfall. Baby Boomers have a 37% shortfall. In terms of purchasing life insurance, the article says, "Get enough insurance to replace the lost income of the deceased, so the surviving spouse can carry on with paying the mortgage and saving for retirement." The American Institute of CPAs has a life insurance needs calculator (link here) to help you determine how much you really need. And, if you have questions about your life insurance policy, or getting a quote, call your agent. Danica Patrick discusses her personal journey and the importance of life insurance. Life insurance is important for your financial health, peace of mind, and protecting your family. Make sure you sign up for a policy today, because this is the hard truth: when you need life insurance, you can't get it. For the sixth consecutive year, Erie Insurance received the highest ranking in the J.D. Power 2018 U.S. Insurance Shopping Study for "Customer Satisfaction with the Auto Insurance Purchase Experience." The study measures auto insurance shopping purchase behavior and purchase experience satisfaction among customers who recently bought insurance, and Erie received the highest numerical score: 877 out of 1,000. This is huge for Erie because J.D. Power surveys real customers and no other carrier ranks higher. Also on the trophy shelf, Erie earned A.M. Best's rating of A+ (Superior). While Erie Family Life Insurance earned A.M. Best's rating of A (Excellent). These accolades speak to Erie's financial strength. Customers can be sure Erie is financially sound and will be there for its customers. Distracted driving is more than just texting. Daydreaming or being "generally distracted" (being inattentive, careless, or distracted-details unknown) or "lost in thought" was the number one distraction associated with fatal crashes. CNN published an article earlier this month about the fact that after years of decline, the injury death rate among people in the United States ages 10 to 19 is rising. The CNN article was based a new report from the National Center for Health Statistics at the US Centers for Disease Control and Prevention. The report found auto injuries to be one of the leading causes of death. The rise in deaths is attributable to injury-related deaths, such as traffic accident fatalities, drug overdoses, homicides and suicides, as opposed to illness. Among 10- to 19-year-olds around the world, road traffic injuries were the leading cause of death in 2015. Motor vehicle traffic fatalities accounted for 62% of these unintentional injury deaths. The new report was based on data from death certificates filed in all 50 states and the District of Columbia between 1999 and 2016. We feel this study highlights the importance of practicing safe driving, as well as the need for our lawmakers to dedicate time and money to creating and enforcing legislation that will support safety on the road. Things like driver-training courses, putting down our phones while we drive, and new laws that address road safety are critical. Hear from real customers why Erie Insurance is consistently ranked among Pennsylvania's best companies for claims service. Whether it's a business or personal insurance claim, it's so important to have an agent who can answer questions and advocate for you with your insurance company. That's the real reason to shop insurance through an agent rather than online. This article published on CNN Money, is an interesting read and illustrates why it's important to get insurance quotes through an agent or a reputable carrier. The article explains, "Increasingly, sites that offer you car insurance quotes or price comparisons can snag the extensive personal information you provide and pass it on to insurance carriers, agents or industry organizations, even without your consent." Often these comparison sites also sell your personal information to third parties; allowing them to build a customer profile of you for things beyond insurance. Check out the full article for tips on how to avoid unknowingly sharing your personal data while obtaining an insurance quote. Bodily injury liability pays others when you are responsible for causing injuries in an auto accident. It could pay for things like someone's medical expenses, rehabilitation expenses, and even pain and suffering or other non-economic damages. The state of PA requires every driver to maintain the following minimums for this coverage: $15,000 per person and $30,000 in aggregate. However, we always recommend our clients carry more than the state minimum. This is one of the most important coverages you carry to protect you and your family's personal assets. Learn the basics of life insurance and how important it is for protecting your loved ones. For more information about life insurance visit http://www.lifehappens.org/lifeinsurance. Clearsurance, an independent community where insurance customers share their individual feedback on auto, homeowner’s and renter’s insurance, has recently ranked Erie among the top 10 best insurance companies in 2018 for both home and auto. 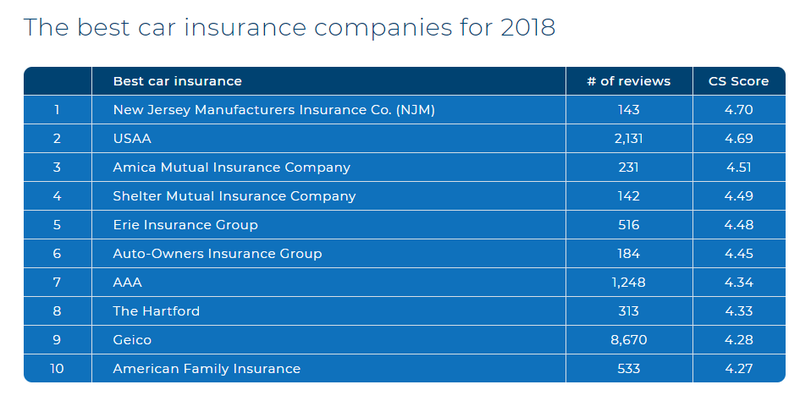 Erie ranked 5th out of 10 among auto insurers, and 2nd out of 10 among the home insurers included. Check out the full articles here: https://clearsurance.com/best-car-insurance-2018 & https://clearsurance.com/best-home-insurance-2018. CNN posted an article today on how Arity, a unit of Allstate insurance, is developing a technology to track smartphone use in cars. The hope is that Allstate will be able to tell when drivers are actively using their phones while operating a vehicle. And, at some future point, Allstate may use the information to determine car insurance rates. It's an interesting article, but the most shocking and fascinating points, to me, were in Arity's research. The article says, "Arity analyzed data from 160 million trips by hundreds of thousands of Allstate drivers. What it found confirmed research showing that drivers on their phones are more dangerous." Using claims data, Arity found that distracted drivers are costing insurers 160% more than drivers focused on the road. The research confirmed that distracted drivers are more likely to get into an accident and these crashes tend to be more severe. In fact, Arity recommends drivers put their phones into airplane mode before heading out in the car. Distracted driving is a topic we at Forbes Insurance Agency have posted about in the past, and will continue to shout about. The effects of distracted driving and using your phone while you drive are now being studied by multiple agencies, and they are all saying the same thing - this behavior is causing more accidents, more fatalities, and more expensive claims for insurers. Here is a link to the full CNN article, titled, "Do you text and drive? Your car insurance may go up," http://money.cnn.com/2018/01/24/technology/texting-and-driving-distracted/index.html. Erie insurance is a terrific company that is constantly receiving industry recognition for its claims and customer satisfaction. But, we at Forbes Insurance wanted to take a minute to shout-out Erie for the ways it helps clients through superior coverage offerings. The following coverages are standard in Erie personal auto policies, while not all are automatically offered by other carriers. Road Trip Coverage - Erie offers up to $75 per passenger in the vehicle for travel expenses if you don’t reach your destination and aren’t close to home. Pet Protection - If your pet is hurt in a covered accident while riding in your car, Erie will help cover the vet treatment costs up to $500 per pet (up to two pets, with a total limit of $1,000). Locksmith - If you lock your keys in your car and carry comprehensive or collision coverage, Erie will reimburse you up to $75 for the cost of locksmith services on your insured car. New Car Addition - Erie gives you 7 days to add a new vehicle to your policy, so if you forget initially, it's okay. Just be sure to contact your agent within 7 days so you have the proper coverage. Personal Items - If personal items are damaged in a car accident, Erie gives you up to $350 toward your personal items not covered by other insurance. For any questions about your exact coverages, always feel free to contact your Erie agent. If you are traveling with the kiddos this holiday season, check out this video on car-seat safety. Have a safe and happy Thanksgiving from all of us here at Forbes Insurance Agency!! While purchasing insurance online can be convenient, there are true benefits to working with an agent, in-person for your insurance needs. Agents are required to have industry licenses and complete continuing education; meaning that when you need guidance and advice, they are equipped to give it. Their industry knowledge can help with everything from choosing the appropriate coverages, to navigating the claims process. Technology is great, but sometimes having a real person to guide you is better. Here is a very interesting article, originally published on Bloomberg, that discusses the surge in U.S. traffic fatalities and how they are linked to smartphone use, but are not being properly reported as such. The article, "Smartphones are killing Americans, but nobody’s counting," states that over the past two years, traffic fatalities have increased by 14.4 percent. "In 2016 alone, more than 100 people died every day in or near vehicles in America, the first time the country has passed that grim toll in a decade," the article reports. The problem is that many of these fatalities are not being attributed to distraction or mobile-phone use. Why is that an issue? Well, because regulators are not getting an accurate picture of just how dangerous cell phones are for drivers, and how many accidents they are actually causing. Without solid evidence (think numbers and stats) to indicate how many accidents are caused by cell-phone use behind the wheel, lawmakers and regulators can not push for new and improved laws or safety features. The article talks about how cell-phone use has changed too; how actual calls are not happening as often as texting and social media. But, I would take it one step further and suggest that using our phones for music in our cars is another distraction. My family has Apple Music, which does sync with my car's stereo, but many times to change playlists, I find I have to look at my phone. Additionally, have you seen the technology packed into most cars today?! Most new cars have touch screens, which, in my opinion, are tricky to use while driving, that can display: music options, navigation, car diagnostics, movies, and more. It's insane how many distractions are built right into the car stereo today. Shift is Erie's initiative to help inform teens about safe driving and get them engaged through safe driving pledges, completing challenges, creating and sharing content through the program's website, and referring friends to the contest. Shift began on Sept. 11, and Erie recently reported more than 1,000 students are participating, representing schools across Erie's footprint. The primary goal of the program is to communicate important facts to help keep teens safe. Check out Erie's graphic below for some of these staggering statistics. And, if you're interested in learning more about the initiative, visit jointheshift.org. Lane-departure warnings lower rates of single-vehicle, sideswipe and head-on crashes of all severity by 11 percent. Lane-departure warnings lower the rates of injury in these types of crashes by 21 percent. The IIHS feels the above results are modest; perhaps because many drivers turn off lane-departure functionality in their vehicles. If all passenger vehicles had been equipped with lane-departure warning, nearly 85,000 police-reported crashes and more than 55,000 injuries would have been prevented in 2015. Blind-spot detection lowers the rate of all lane-change crashes by 14 percent and the rate of lane-change crashes with injuries by 23 percent. Police reports include information on the circumstances of a crash, making it possible to look specifically at the types of crashes that particular technologies are designed to address.